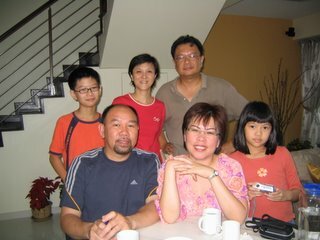 Cynthia Cheong Lee Yin has surprisingly shown up at my doorstep on 7th January 2006 afternoon, after missing in contact for several years. For those who do not recall who is this tycoon “tai tai” looking friend, her family used (or still) to own some Chinese medicine shops at Kulai main road. Cynthia and husband Sam (i call him tukang masak) who was a trained culinary grad from New Hampshire college, USA are now proud owner of a cafe/deli shop in suburban of Auckland New Zealand. In the background are my wife Michelle, children Dylan and Samantha. Cynthia's children Julia and Jasmine who were at their teenage parent withdrawal syndrome did not tag along to see their mummy's boring old friends, instead, they have chosen to roam the shopping strips at Orchard road.